Glenmill community fibre campaigner Nav Sadiq (R) with Openreach engineerJames McGovern (L). People living in a new housing development near Giffnock are set for a major broadband boost - thanks to a superfast crowdfunding appeal and Openreach’s Community Fibre Partnership scheme. 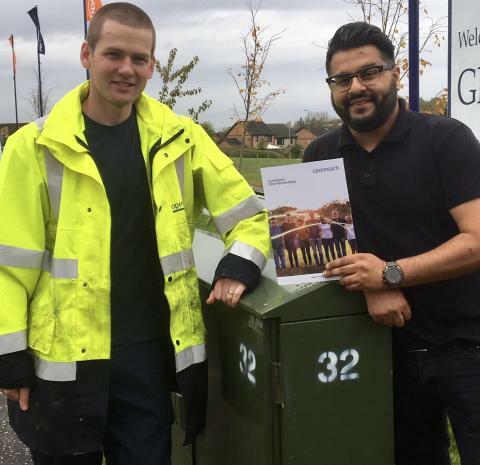 Glenmill resident Nav Sadiq used the crowdfunding service Spacehive – which raises cash for projects that improve local environments – to raise the money needed to co-fund the project with Openreach within a week. More than 300 Glenmill households will benefit when engineers from Openreach, Scotland’s digital network business, install the new network using Fibre to the Cabinet (FTTC) technology at speeds of up to 80Mbps. Nav took on the project on behalf of the community because having access to high-speed broadband will make a huge difference to everyone there. He said: “We have multiple people who work remotely, have professional lives and have families - and having access to fibre, for a variety of reasons, is crucial in this day and age. It will mean the world to so many. Chris Gourlay, Founder and CEO of Spacehive, said: "We're thrilled that Glenmill has managed to smash their funding target at record-breaking speed. It's exciting to see more and more communities across the UK working with Spacehive and Openreach to quickly raise the funding they need to install superfast fibre broadband locally." Robert Thorburn, Openreach partnership director for Scotland, said: “It’s great that we’ve been able to work with the Glenmill community to find a broadband solution and I congratulate Naz and the residents on their phenomenal success with Spacehive, becoming our fastest-yet community fibre fundraisers. This is a real template for what can be achieved. “Partnerships like this help us to bring high-speed connections to those areas that, for many reasons, broadband providers struggle to upgrade alone. More than 90 per cent of Scotland can access superfast speeds today, and we’re committed to making fibre broadband as widely available as possible. The Community Fibre Partnershipscheme is designed to help people in places not included in any current roll-out plans to bring fibre broadband to their local area, working with Openreach to co-fund the installation. If a local school benefits from the project, communities can also benefit from a BT Group grant that will cover up to 75 per cent of the cost, capped at £30,000. Once the network is in place, typically within 12 months, communities have access to a wide range of providers who offer their services over the Openreach network, bringing competition and choice. Across the UK, more than 350 CFP schemes have already been agreed, with more than 150 communities already able to benefit from faster internet speeds when they order services from a provider of their choice. Crowdfunding is based on the idea that a number of people can split the cost of something – in this case fibre broadband – with multiple people contributing. Openreach engineerJames McGovern and Glenmill community fibre campaigner Nav Sadiq. 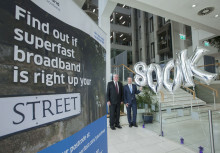 More than 800 homes and businesses in Giffnock are now able to connect to high-speed fibre broadband thanks to the £428M Digital Scotland Superfast Broadband programme. Pupils from Braidbar Primary School joined the Digital Scotland team to unveil the latest fibre availability in the East Renfrewshire town this week.